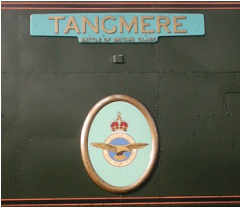 34067 Tangmere is one of Oliver Bulleid's Light Pacific's 4-6-2 Battle of Britain Class. The powerful locomotives have the power classification 7P5F. An unrebuilt example, restored first by Ian Riley in Bury, the locomotive joined the West Coast Railways fold and is generally based at Southall. It hasn't always had the best of luck and has had numerous periods out of traffic due to numerous issues.